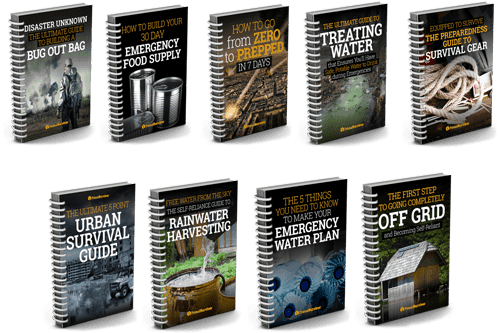 Without adequate shelter we won’t make it very far in a survival scenario. 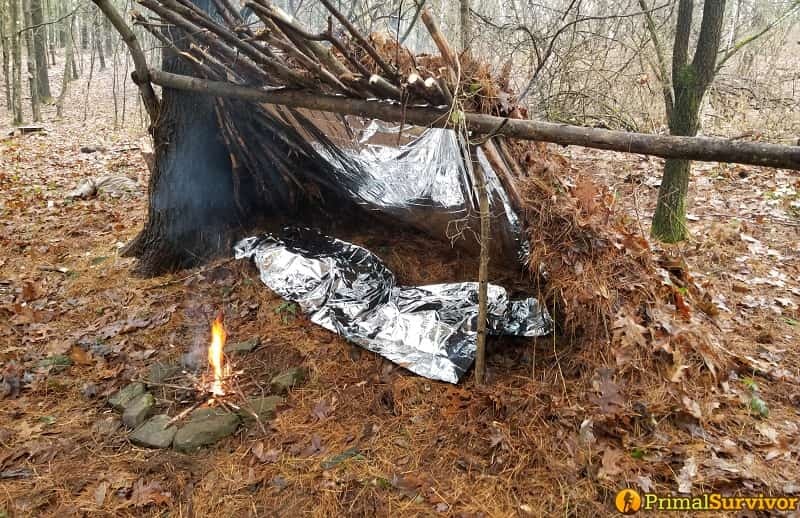 From camping-trips-gone-wrong to becoming separated from your group to a true SHTF scenario, a roof over your head can be what makes or breaks your encounter. 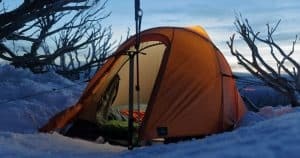 Having a bit of knowledge on how to build a lean-to shelter can dramatically improve your experience, so let’s check out what we need to know about building some temporary housing. 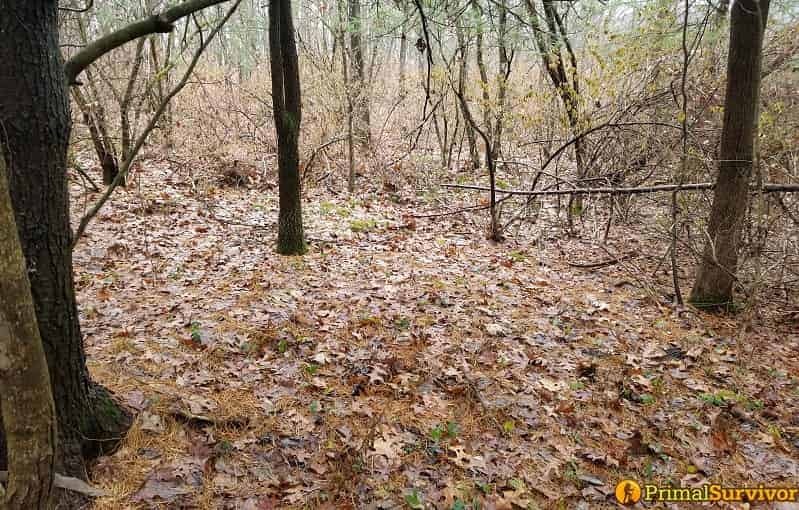 If you’re in a situation where you need to be concerned with being spotted by unfriendly folks, location selection should involve a degree of camouflage and separation from the beaten path. Constructing your shelter with an irregular shape and applying some local materials to help it blend in are important choices. A shelter constructed in different environments requires different considerations, but the focus of this article is on a wooded lean-to shelter. A good location is crucial. I admittedly cheated when selecting the location for my lean-to shelter. It was on family land adjacent to an old campsite I know is dry, flat, and comfortable to sleep in. 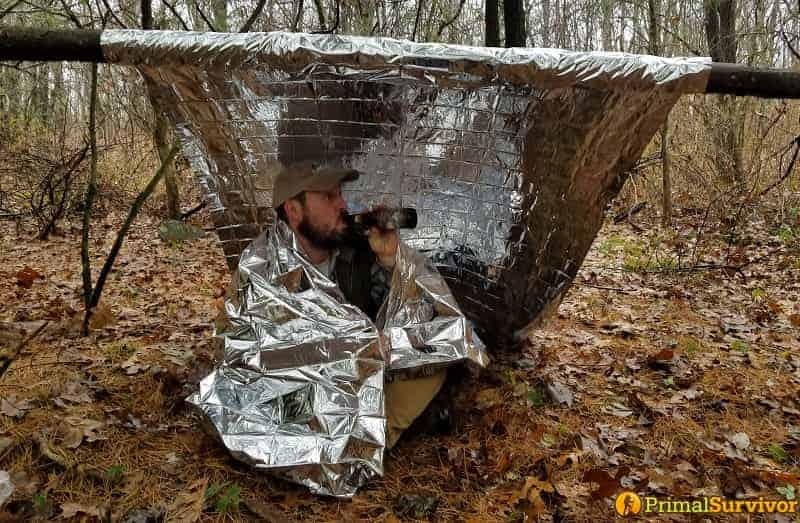 It provides ready supply to essential needs like water and fuel for fires, is in a secluded and discreet location, and is an easy-to-access area from local roads. We found the remnants of an old campfire which is a good indicator that the location is reasonable for staying in. 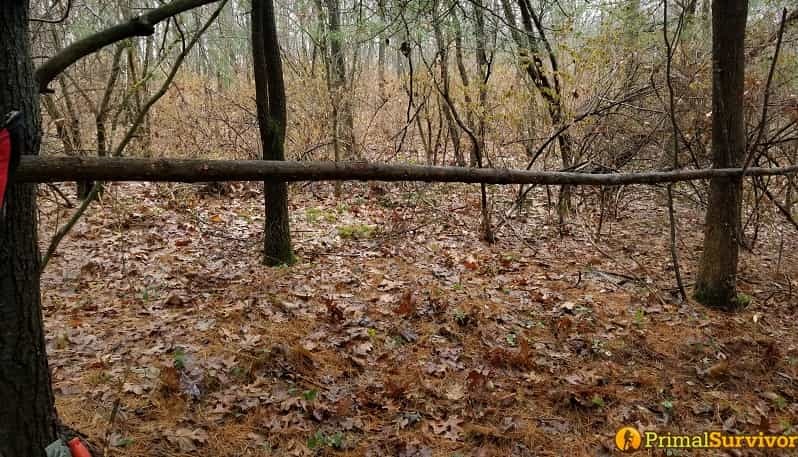 Other evidence to keep an eye for is the presence of deer beds, indicating it’s a safe place for them to avoid detection and get some rest. We used an e-tool to scrape away some of the leaves and detritus but quickly decided it was unnecessary. 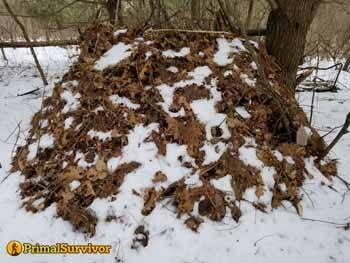 I elected to use a mid-sized fallen trees as the main support of my lean-to shelter. I nestled it into the crotch of one standing tree and fashioned a Y-shaped support from another fallen stick to support the opposite end of the log. A lean-to shelter needs something to lean on, so a strong and reliable “center beam” is super important. It isn’t crazy to consider digging a shallow trench to place the base of your lean-to shelter’s “roof” to sit firmly in, but for this demonstration I decided not to. 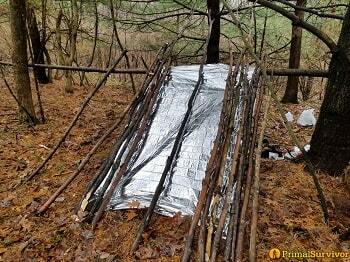 For this shelter construction I semi-cheated and brought two heat-reflective mylar blankets with me. 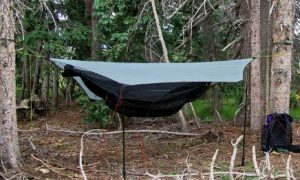 I used one of these as a base layer of the roof and the other for its intended purpose; a blanket. A blanket to drink beer in! My new clubhouse isn’t very comfortable. In addition to the survival blankets we also used some paracord,an axe, a knife, a survival shovel, and a six-pack of beer. Almost anything you have on hand is potentially helpful to your scenario, so be creative and think outside of the box! This is a point that might raise a few eyebrows, but that’s alright. We’re going to jump into it anyway. I am a firm believer in doing things one step at a time. 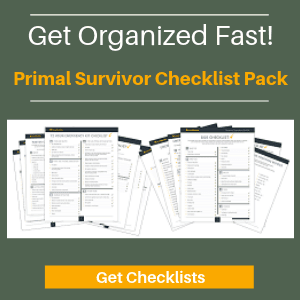 This one-thing-at-a-time method isn’t a slow and arduous process, no! 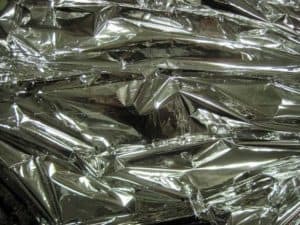 Instead it’s a method that allows you to focus on one step of the journey at a time; in this case, we’re collecting as much material as we can to form the roof of our lean-to shelter in one go. Between a friend and I we collected about 50% of the total material needed in our first shot. After this initial collection we were able to better gauge exactly how much material we would need and avoided wasting time and energy procuring what might be wasted supplies. 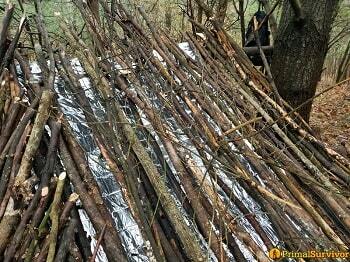 We used only dead wood for our shelter. On our journey hunting for supplies we passed many standing trees that would have been perfectly suitable for shelter construction… but the time spent cutting and obtaining this live wood is likely comparable to our time spent finding only dead wood. It took us about an hour to find the supplies needed. We attempted to duplicate the rushed feelings and urgency of a survival scenario when building our shelter, so we didn’t make this shelter pretty. Besides, my buddy’s wife and their newborn baby demanded his attention, so the sense of urgency wasn’t hard to fabricate. We laid the collected wood and supplies on the ground and leaned them against our main support pole as tightly as they’d fit. Thinner sticks were used to fill in the gaps between bigger ones and those with unforgiving bends and crooks. 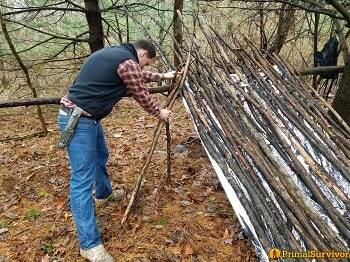 Lashing these sticks to the main beam could be useful if the structure is going to become a more permanent place to stay, but for a short duration simply leaning the sticks is adequate. We also could have cut the sticks used here to be of uniform length, but that’s a project for an extended stay and not an emergency overnight shelter. Construction here is the same as it was for the roof; simply lean the sticks! However, because these walls run on a different plane than the roof, the sticks will lean against the ends of your roof structure. This can be a bit tricky to coordinate but it isn’t impossible or overly frustrating. For this shelter we started at the tallest section of the wall and worked down to the ground, but either “direction” should work. Step 5: Cover It Up! 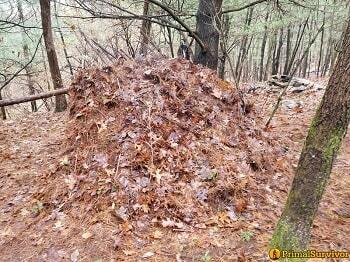 I situated this lean-to shelter in an area with plenty of detritus around to function as camouflage and insulation. Simply grabbing handfuls of leaves and pine needles and piling it on the wooden structure is all you need to do. A few initial handfuls of more sticky material can help the leaves covering your shelter stay in place. I also added a larger pile at the bottom of the structure to serve as a base preventing leaves and material on top from cascading down. Pressing the leaves and needles into the slats of the lean-to helps to keep them in place. In general it’s wisest to keep your fire well away from where you’re sleeping. For this demonstration we made a very tiny fire pit to sit near the base of the shelter to provide a bit of warmth. 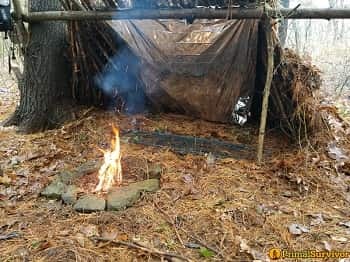 The wet conditions we constructed in meant the leaves we covered the shelter with were wet and almost impossible to ignite. Too close for comfort in most scenarios, the conditions our shelter was built in were safe for a nearby fire. 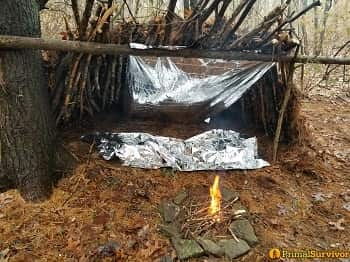 I visited the shelter during a winter hike through the woods and was delighted to find the bedding area dry and warm. 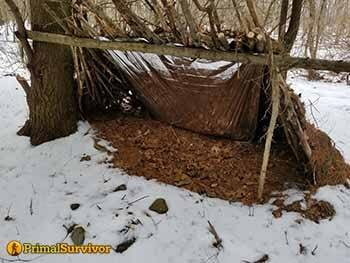 This shelter hasn’t had any attention, care, or upkeep of any kind in over two months. The leaf matter we used to cover the roof of the shelter was largely intact minus a few gaps, easily repaired. Most important is how dry the ground beneath the shelter was. 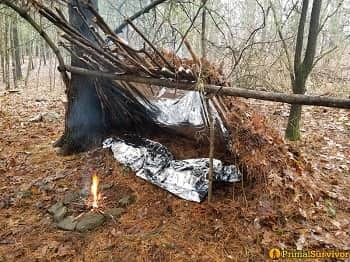 It’s not a fancy shelter, but it gets the job done! We decided to keep this shelter basic with no frills. You’ll find plenty of incredible designs on the internet from master woodsmen producing expert-level shelters. 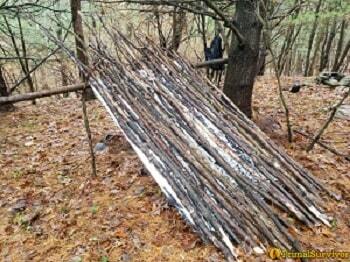 But chances are you’re not a master woodsmen, so a quick lean-to shelter like this is a solid starting point. If you’re anticipating a longer stay than a night or three, some improvements can be made to this shelter to make it safer and more comfortable. 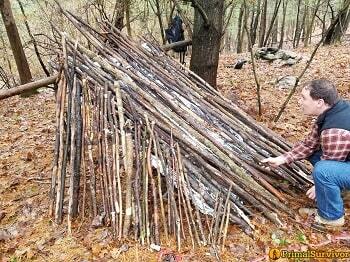 Grab more materials to make this an A-frame shelter with two walls and a single entrance. Add another layer of sticks and material to make your roof stronger, and fill-in this space with more leaf matter to make your structure better insulated. A raised sleeping platform is an incredibly comfortable addition to any shelter, and with a simple design like the one we have here this platform is easily added. For really long-term stays you can weave pine branches into the roof slats and dress with leaf matter. For this instructional demonstration I worked with a friend and used construction supplies obtained solely from fallen trees, or deadwood ethically removed from standing trees. 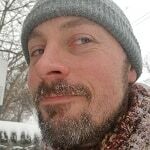 A true survival scenario would find me far less picky about what supplies I am utilizing. 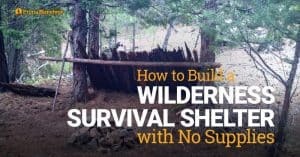 I admit upfront that I am a total tree hugger, so bear with me when I offer this suggestion: if you’re only practicing your lean-to shelter building skills, use exclusively fallen and dead wood. Avoid cutting down live trees unless you’re familiar with their purpose in the environment. In a true survival scenario these rules can be broken, but if it’s just for practice try to practice some restraint. 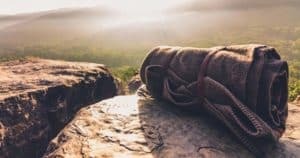 As important as this rule is to general outdoors practice, it’s potentially more important when considering a SHTF scenario where you are trying to maintain anonymity. Disappearing into your environment is far easier when you don’t leave freshly-sawn logs and trees around your shelter site. Those flat stumps stick out like a sore thumb. Carefully harvested materials and diligent efforts to minimize your tracks can be life-saving. Simply rubbing a handful of dirt or mud onto a freshly sawn limb can limit its spotability.